Use QuickTapSurvey to collect fast, actionable insights from your visitors with on-site surveys. No internet connection needed. Collect data from visitors no matter where they are in your museum. QuickTapSurvey works seamlessly on all iOS and Android devices. Have unreliable WiFi? No problem! Easily use your satisfaction surveys offline. Your data will sync with your account when you reconnect. Build professionally branded visitor satisfaction surveys that are easy for your users to fill out. No coding or technical knowledge required. Collect feedback in a variety of formats by using different field types, including rating scales, email capture, NPS scoring, and much more. Send automated emails to thank your visitors for coming to your museum and encourage them to leave feedback on popular review sites. Get a live pulse of your visitors with daily, weekly, and monthly satisfaction reports created with Net Promoter Score (NPS) and CSAT scoring. Transform tablets into kiosk stations to let people complete visitor satisfaction surveys unattended. Instant notifications will alert you to issues. Let visitors complete surveys in their own language. International keyboards make it easy for users to complete text-based survey questions. Use automated email alerts to notify team members of new submissions and ensure negative feedback is addressed as soon as possible. Connect your visitor satisfaction surveys to apps like MailChimp, Zapier, and Salesforce to easily manage visitor data. Add new visitor profiles to your CRM, update your email lists with new contacts, organize feedback in spreadsheets, and much more. Discover ways to improve your museum by asking visitors to rate their visit. Collect key insights on your visitors, including demographics and preferences. Capture emails on your feedback surveys for easy lead nurturing and follow-up. Create museum feedback surveys from scratch or get a headstart by customizing one of our pre-built templates. 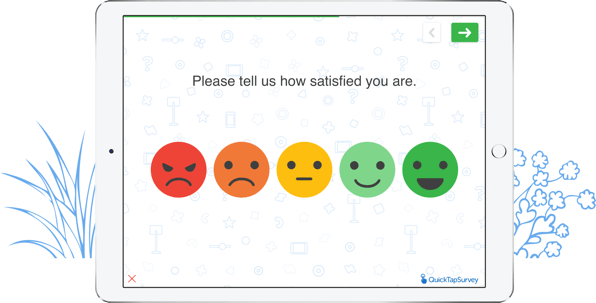 See QuickTapSurvey's visitor satisfaction surveys in action by starting a free trial.